Tobotor-Eye Drops is an antibiotic eye drop. Tobotor-Eye Drops is an aminoglycoside antibiotic that kills susceptible bacteria by blocking bacterial protein synthesis. Death of susceptible bacteria occurs because of the lack of functional proteins. Tobotor-Eye Drops treats only bacterial eye infections and does not work for other types of eye infections. Studies have demonstrated tobramycin is active against susceptible strains of the following microorganisms: Staphylococci, including and (coagulase-positive and coagulase-negative), including penicillin-resistant strains. Streptococci, including some of the Group A-beta-hemolytic species, some nonhemolytic species, and some . , most strains and and some species. Bacterial susceptibility studies demonstrate that in some cases, microorganisms resistant to gentamicin retain susceptibility to tobramycin. In Vitro Data: In vitroS. aureusS. epidermidisStreptococcus pneumoniaePseudomonas aeruginosa, Escherichia coli, Klebsiella pneumoniae, Enterobacter aerogenes, Proteus mirabilis, Morganella morganiiProteus vulgaris, Haemophilus influenzaeH. aegyptius, Moraxella lacunata, Acinetobacter calcoaceticus Neisseria. 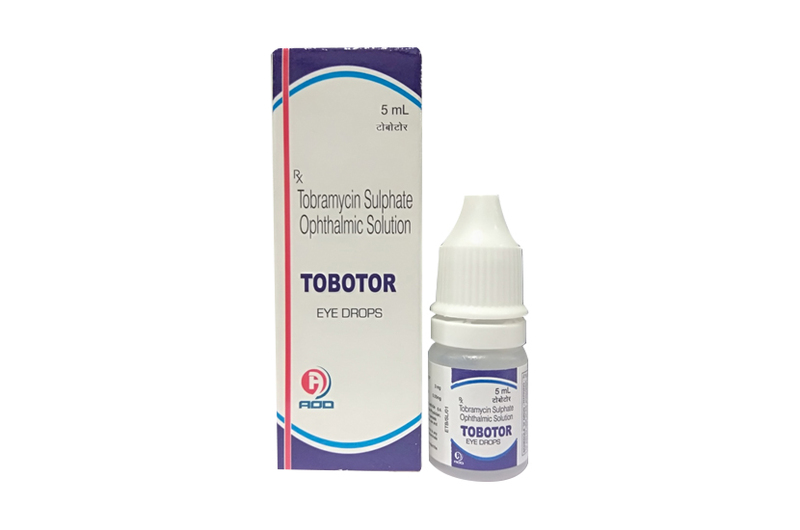 Tobotor-Eye Drops is used to treat eye infections. Tobramycin belongs to a class of drugs called aminoglycoside antibiotics. It works by stopping the growth of bacteria. Tobotor-Eye Drops treats only bacterial eye infections. It will not work for other types of eye infections. Unnecessary use or overuse of any antibiotic can lead to its decreased effectiveness. The uses of Tobotor-Eye Drops is contraindicated in patients with known hypersensitivity to any of the ingredients of the formulation. The use of Tobotor-Eye Drops is also contraindicated in epithelial herpes simplex keyratitis (dendritic keratitis), vaccinia,varicellanad may other viral diseases of the cornea and conjunctiva, mycobacterial infection of the eye and fungal diseases of ocular structures. FOR TOPICAL OPHTHALMIC USE ONLY. NOT FOR INJECTION INTO THE EYE. Sensitivity to topically applied aminoglycosides may occur in some patients. If a sensitivity reaction to Tobotor-Eye Drops occurs, discontinue use. Tobotor-Eye Drops is supplied in 5 ml clear poly bottles packed with printed labeled in a unit carton and, Such 25 Carton packed in a shrink sleeves.such,12 shrinks packed in a shipper.